Words & images by Kalle Grahn, Guideline Power Team Sweden. Fellow angler – Hajas Andersson, Guideline Power Team Sweden. Childhood memories, roots. The starting point of a lifelong love story. Perch is the first species of fish many of us here in Scandinavia come in contact with. A red and white bobber, top tied bamboo rod, a barbed hook baited with a worm and a father learning you the ropes. My father barefoot in worn mended jeans, t-shirt and suspenders, handling the oars, baiting the hook, having a sip of beer from that well-known blue beer can with the ship on the label. Simple life, summer, holiday – a relaxed and present father. Best possible circumstances to lay a foundation for a passion. From bamboo to glass fiber and then graphite. A learning curve coinciding with the improvement of new rod materials and the development of the WF-lines we now take for granted. Interest turned into a passion. But focus naturally turned towards the salmonids and I forgot about my striped friends. Finding peace in the small things in everyday life is what the Zen masters try to teach us. But still we travel the world in pursuit of the fish of a life time. Over the years I have come to respect and understand the aged flyfisherman. I’m happy to see that I’m starting to develop an interest towards the everyday fish, the smaller inhabitants of the rivers and lakes just outside my doorstep. In contrary to the search for a dream – finding peace in the small things in life – closing the circle. 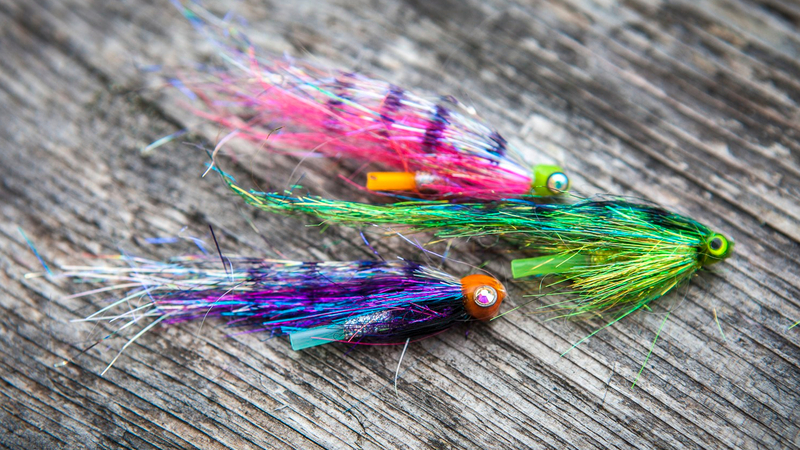 Perch is the everyday fish, it might not be in your vivid and colorful dreams. But nevertheless, it’s out there ready for a fight in a water near your home. And gee how well these critters go in the frying pan in company with some white wine, cream and parmesan cheese 😀 Enjoyed in company with a father, friends or the Zen master of fishing himself – it does not matter, it’s the perfection of everyday life. The equipment we use for perch fishing is a 9 foot rod in #5 and ULS multi tip or ULS 3D +, 14 grams works great. Ultra Light Scandi, ULS, is a shooting head for single-handed rods and it’s incredibly easy to spey cast, perfect in small to medium sizes rivers. We have fished perch from boat with ULS with amazing results! It’s quick to change the tip or shooting head depending on the depth of the water, easy to lift and carries large heavy flies with ease. ULS multitip with floating body and tippets down to S4/S5 is enough for depths down three meters. When fishing in deeper waters the ULS 3D+ in sink grade I/S24 or S/135 is recommended. The ULS lines are easy to lift because of their short length, around 7 m, and normally require just one cast to shoot all the running line you need. When fishing from a boat with overhand casts we recommend that you pinch the running line slightly with your fingers in the front cast because it doesn’t get any resistance from the water. This line needs some resistance to turn over properly, because it goes out really fast and far away. The ULS heads works great with Compline II 25lb or 35lb mono shooting lines. If you prefer a coated shooting line the pre-looped TSL Evolve 25 lbs is the way to go. Flies with flash and heavy heads work great, colors vary. Search for perch on deep edges and throw the fly over it and let it sink to the bottom. Take home the line with 2-3 strips and let the fly sink again, fish all the way up the shallow water. A more or less a standard jigging method applied to fly fishing. The most effective strike when fishing with sinking line is the strip strike. If you make a regular strike and lift the rod the reaction time is too long, and the fish often spit the fly. Does the 14 grams ULS multi tip and ULS 3D shooting heads work in overhead cast in #5 LPXe rod? Weight recommendation for the rod is 11-13 grams and for these two lines recommendation in overhead casts for #5 rod seems to be 12 grams.